From aboard Coral Expeditions I, South-East Tasmania. Weather: Strong winds 35-40 knots. Sea: 3-4m swells. Coral Expedition I. 35m, 50-passenger catamaran cruises at 12 knots. At anchor near Woodbridge showing new 'navy grey' hull. 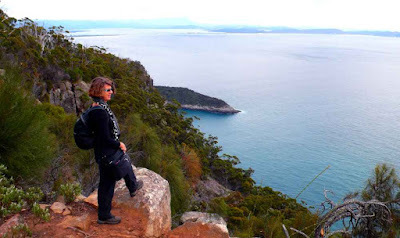 With stunning ocean scenery, precipitous sheer cliffs, fascinating wildlife and rich history, the remote southernmost reaches of Tasmania have been crying out for a dedicated small ship cruise product for years. Cruise ship visits to the delightful capital city Hobart are nothing new, and the shore-side offering has been growing steadily over the years to the point where a new dedicated cruise ship terminal is now in operation within an easy stroll to the city centre. Many of the traditional cruise ships offer comprehensive shore excursions to the wine regions or historic Port Arthur. Even simple city walks are enriching with precincts like Salamanca Place offering all manner of interesting diversions for casual visitors. Yet beyond the reasonably accessible city limits lies a whole other world of possibilities. Recherche Bay, Cockle Creek, Bruny Island and the surrounding national parks to the south are full of great places to visit. 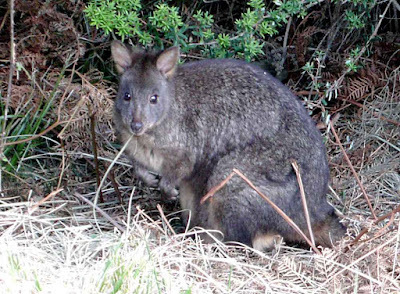 While ashore, we take a vigorous hike to the lookout at Fluted Cape on South Bruny Island, to take in the wild scenery and meet a few of the locals like the Swift Parrot and wallabies who live in the park. In the village below, the Bligh Museum is a wonderful, if compact, trove of memorabilia dedicated to the early explorers of the region, particularly William Bligh who anchored here along with the French around the end of the 18th Century. The 'holy grail' for expedition ships in this region however is remote Port Davey in the far Southwest National Park. Accessible only by ship or light plane, Port Davey and Bathurst Harbour contain natural treasures that send conservationists and nature lovers into a frenzy. 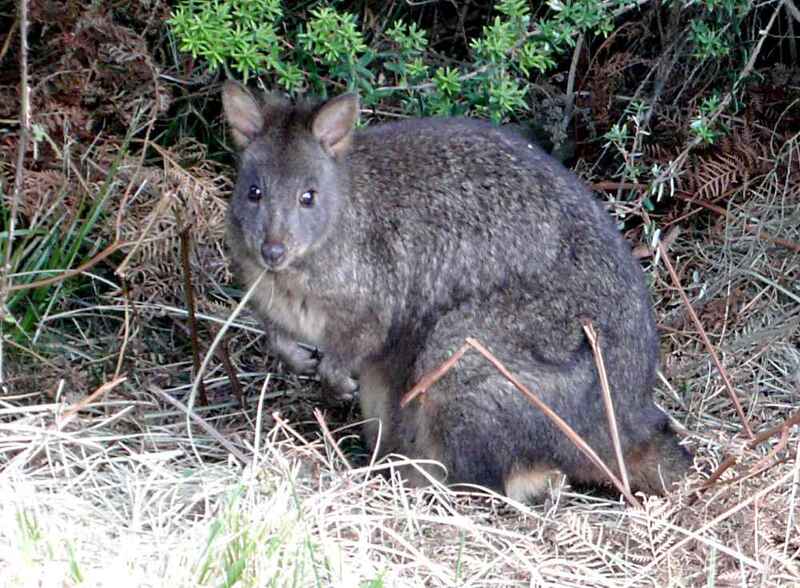 Listed by UNESCO primarily for its rare temperate rainforests and wild rivers, the vast rugged area includes many rare and threatened species of flora and fauna, perhaps even the last redoubt of the legendary Tasmanian Tiger. Since the late '90s, the more adventurous small ships have attempted to make Port Davey a feature of Tasmanian itineraries. I'm told the first exploration by a modern expedition vessel was by Clipper Odyssey, closely followed by Akademik Shokaleskiy in February 1999 with Clipper Odyssey venturing beyond Port Davey into Bathurst Harbour. 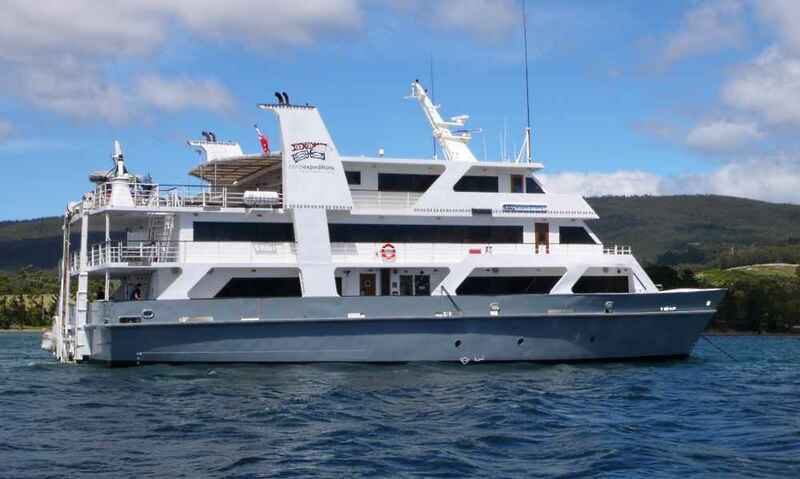 In 2006, Strahan-based small ship operator, World Heritage Cruises, also added Port Davey to their portfolio of overnight Gordon River voyages in the brand new, 24-passenger catamaran, MV Explorer. Ultimately that company withdrew overnight voyages and the ship was sold overseas, deciding instead to stick with their tried and tested day cruises on Macquarie Harbour. Orion Expedition Cruises followed in early 2006 with the 100m MV Orion, making numerous attempts to enter Port Davey during their west coast season, not always successfully. By 2008, Tasmania was off the menu. As this was my first time back aboard a Coral Expeditions (formerly Coral Princess Cruises) vessel for several years, it was encouraging to see the company's first all-new ship in tip-top trim. New company owners have injected much needed funds into the fleet upgrade program which will see on-going improvements to all three vessels. Coral Expeditions (formerly Coral Princess) was launched in 1988 to replace the aging Fairmile-class launch and herald a new era for the company which has grown to the three-vessel fleet it is today. Anyone familiar with Tasmanian waters will tell you things can get pretty hairy with weather blowing straight in from the Southern Ocean. The west coast in particular gets more than its fair share of battering and one of the chief reasons the south west coast remains virtually uninhabited is thanks to this inhospitable treatment. And here we are on the verge of summer, rugged up against biting winds and chilly temperatures. When the warming sun makes an appearance, it's a delightful respite, like the day it graced us for our hike to Fluted Cape. However the seas have not been kind, with winds whipping up an uncomfortable swell and Captain Nathan of Coral Expeditions I has (so far) delayed our westward attempt in the hope the oceans settle sufficiently to allow a reasonably comfortable passage. Expedition cruising, as you've read here and elsewhere many times I'm sure, is all about flexibility of itinerary. Because of the nature of the destinations attempted, ships are always at the mercy of the elements, predominantly wind, ice and tides. As such, passengers must bring with them an attitude of preparedness and not be dogmatic about schedules as it will always be the captain's call whether any passage is safe (or not) to attempt. 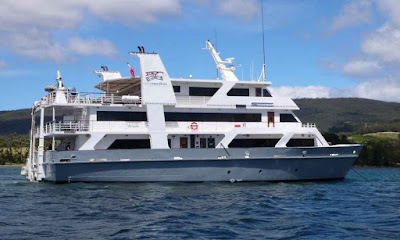 Consequently, if you are keen on sampling Coral Expeditions new Tasmanian itinerary, keep your fingers crossed for Port Davey by all means, but be mindful that conditions may well prevent the ship from making the 250km+ roundtrip from South East Cape. Either way, there will be plenty to see and do in the relatively calmer waters of the south-eastern region.